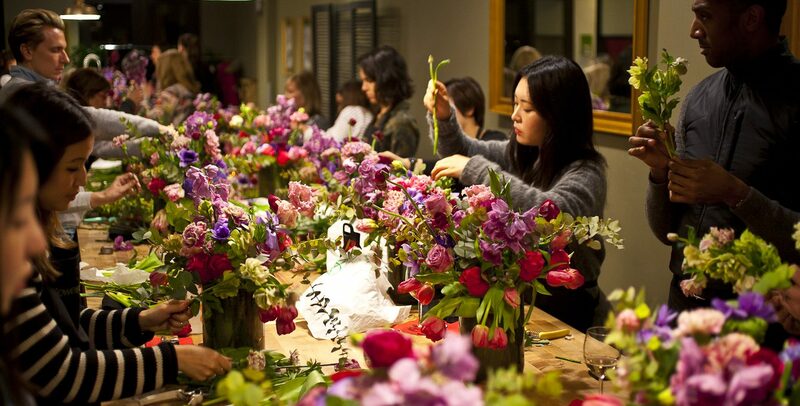 Tuition includes the floral designs that students create in each of the four classes, vessels, a floral knife, floral clippers, a FlowerSchool New York apron and FlowerSchool New York Handbook & Recipes. Students who take this series need not have had prior floral design training. A desire and interest in learning the floral basics are all that are required. The first class of this series will introduce the basic structures and principles of floral design using one of the most common flowers; roses. Students will learn how to select roses (and other flowers) for freshness and color, how to properly use the florist knife and why it is important and how to clean and condition flowers to help the flower last as long as possible. Students will accomplish and learn modern styled ‘twist’ technique with hard-stemmed roses. This technique is an essential design mechanic for most florists and can be done with a variety of flowers to pull off a very sophisticated design. In this class students will learn the characteristics of soft-stemmed flowers and how to construct a graphic look. This entails different flower care and a design method. Students will learn how soft-stemmed flowers grow and who grows the best varieties. Students will accomplish a graphic design style learning how to manipulate the stems, selecting the correct vase and create a more graphic look. After working with mono-floral (single type of flower) designs, this class will discuss the methods of combining different varieties of flowers together for centerpieces. Design concepts including size, proportion, vase choice and balance will be worked through. Class Four is a fresh and contemporary take on a traditional look- the Hand Tied Bouquet, which is a popular and necessary mechanic in floral design. Students will learn the principles of this design style and how the look can be reminiscent of a Dutch still life painting. Focusing on mechanics, the class will learn how to construct a hand tied bouquet and how to evenly distribute elements with stems going in the same direction. Students will learn which flowers are suitable, how to choose flowers/colors that are harmonious, how to condition each variety of flower for longevity and how to create an organized, balanced and beautiful hand tied bouquet. The Introductory Series is designed to be taken as a series of four classes, and is the first four classes of our Intensive Series.